This Savory Herb Braised Brisket is the very first brisket recipe I ever developed, and it continues to be a family favorite. 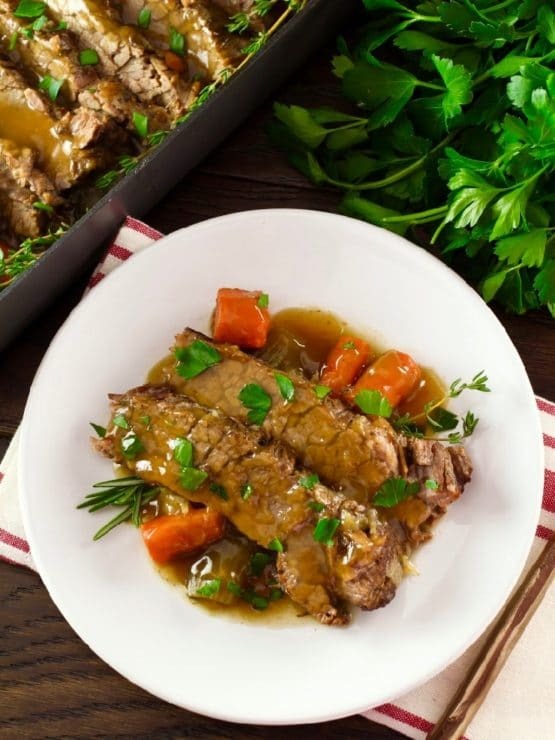 With carrots, celery and aromatic fresh herbs like rosemary and thyme, this tender, saucy brisket is perfect for holiday celebrations like Passover and Rosh Hashanah. This braised brisket cooks slowly for a long time, allowing the fresh herbs to deeply flavor the meat. Your house will smell amazing as it cooks! People often ask me what cut of brisket works best for my recipes. I generally recommend first cut, untrimmed. The first cut is easiest to find in supermarkets; it is shaped flat and has a thinner layer of fat. Second cut works great too– it is shaped with a point, and has a lot more fat. You’ll generally get more meat servings out of a first cut than a second cut. Whichever cut you use, do NOT ask the butcher to trim the fat. Brisket needs fat for flavor and moisture during the cooking process; trim it before cooking, and you’ll end up with dry, unappetizing meat. You can trim the excess fat after cooking. I show you how below. More people are turning to grass fed meat; it is naturally leaner and healthier, and often grass fed beef is hormone free. If you choose a grass fed brisket, you will likely need to cook it a bit longer. The lean quality of the meat makes it tougher to break down, and really requires a low and slow approach. If you choose a grass fed brisket, definitely do not trim it, and keep an eye on liquid levels as it cooks to make sure it stays moist. Make a day ahead using the instructions below for easy slicing, and less preparation to worry about on the day you serve. You can make gravy from the pan drippings using a slurry of potato starch, then cover the meat with the rich herby brown sauce. This pairs really well with my Saffron Mashed Potatoes or Roasted Root Vegetables. It’s all very easy to make! 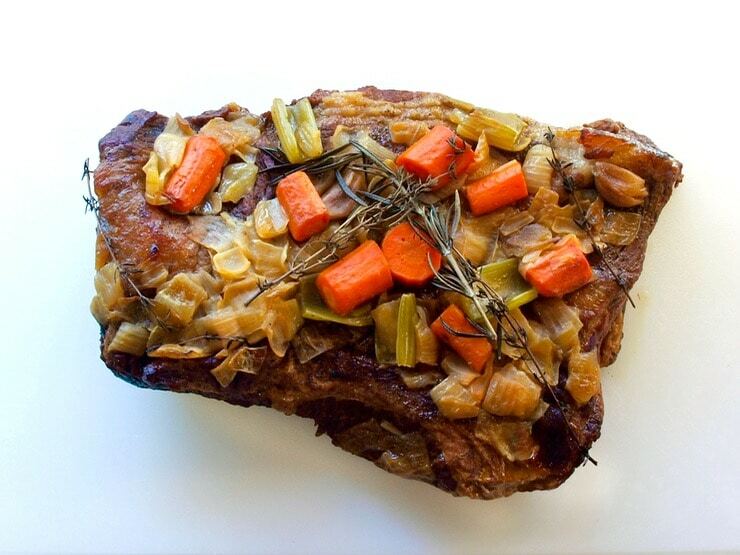 Easy recipe for tender, mouthwatering Savory Herb Braised Brisket with fresh herbs and garlic. Slow cooked tender holiday brisket. Kosher for Passover. You will also need: Large heavy roasting pan with lid recommended, or use layer of parchment paper and layer of aluminum foil to cover. If you do not have a heavy roasting pan, please use a skillet for the stovetop sear described in instructions below - aluminum or disposable pans will not hold up to the searing process. In serving size, I calculate 1/2 pound of brisket per person (uncooked weight) plus an additional 2 pounds over for those who take larger portions. A 6 pound brisket will feed roughly 8 people. You can adjust cook time and servings for a larger or smaller brisket accordingly. Gluten free Note: If you’re cooking gluten free, make sure that your beef broth and potato starch are certified gluten free. Preheat oven to 300 degrees F. Rinse the brisket and pat dry. Rub both sides of the meat with black pepper and kosher salt. Heat roasting pan over a medium flame on the stovetop. Drizzle a few tablespoons of olive oil into the pan. Brown the brisket on both sides—it will take about 4 minutes per side. Remove brisket from the pan. 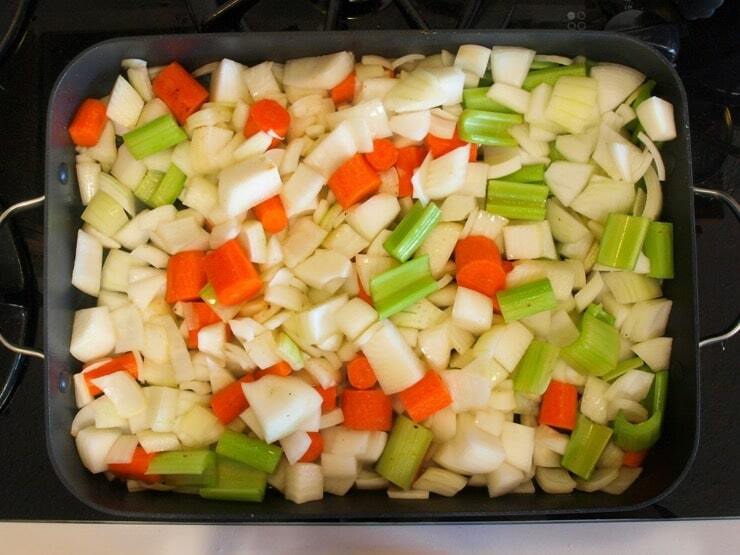 Drizzle a little more olive oil in the pan and add the diced onions, carrot slices and celery chunks. Sauté the vegetables for a few minutes, scraping up the brown bits on the bottom of the pan with your spatula. When onion is translucent and carrot slices are slightly caramelized, scoop vegetables out of the pan and place in a bowl. Pour beef broth into the bottom of your pan until covered. Scrape up any remaining brown bits on the bottom of the pan as the broth heats up. When broth is hot, add half your vegetables back into the pan spread out across the bottom. 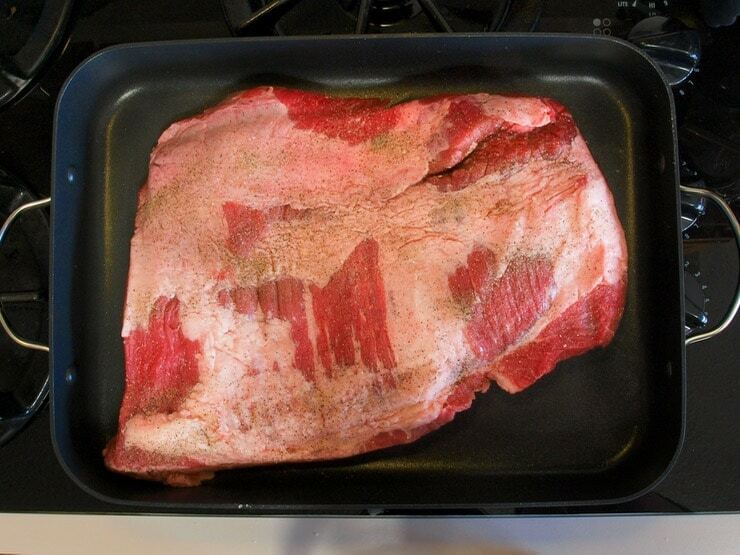 Place your brisket back into the pan, fatty side facing up. Place garlic cloves on top of the meat, evenly spaced. Add the remaining veggies to the pan, spreading them on top of the brisket to cover. 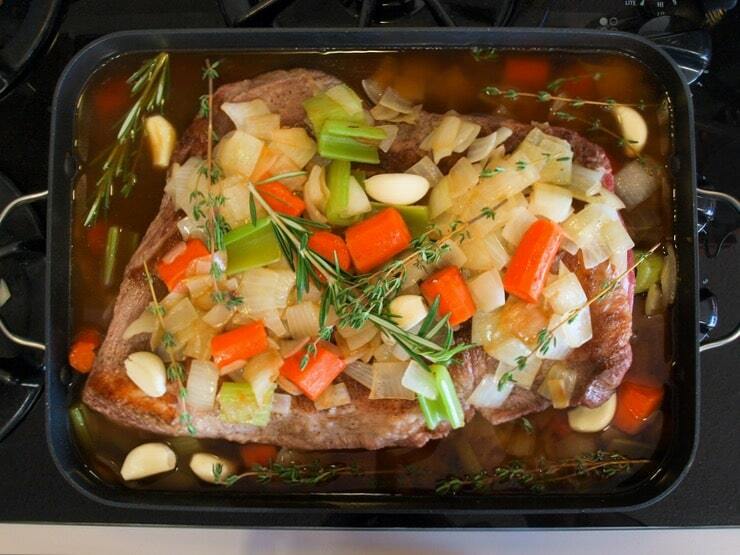 Place herbs on top of the brisket and in the broth, evenly dispersed. Pour more broth into the pan until it goes halfway up the sides of your brisket. Cover roasting pan tightly with a layer of parchment paper, followed by a layer of foil, and place in the oven. If your roasting pan has a lid, use that instead of the parchment/foil combination. Let brisket roast undisturbed for 5 to 7 hours. It will take about 1 hour per pound of meat (leaner and grass fed cuts of meat may take longer—test for doneness). Brisket will shrink as it cooks. The meat is ready when it is fork tender and very easy to slice. Remove brisket from the pan. At this point you can follow make-ahead instructions below, if you wish. If you are serving right away, let it rest on the cutting board for 20-30 minutes before slicing. Meanwhile, strain pan drippings from the roasting pan into a saucepan and allow to cool. Reserve cooked vegetables. 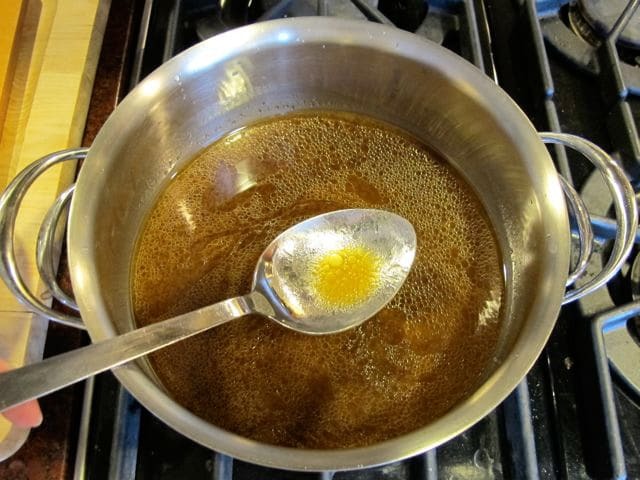 Skim fat from the surface of the pan drippings using a spoon. Reheat the remaining liquid on stovetop. 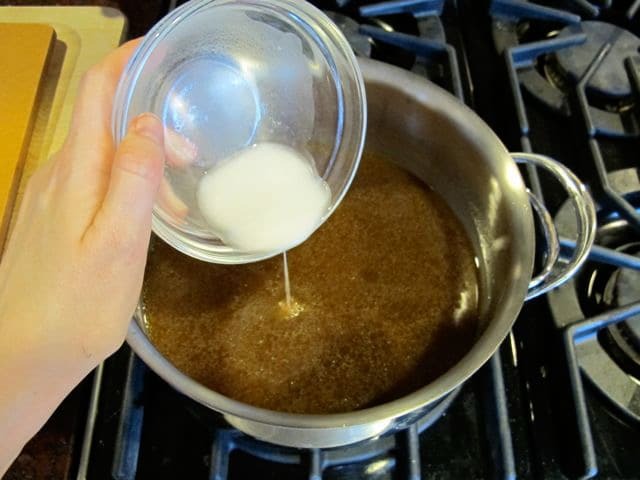 Stir together the potato starch and 1 1/2 tbsp cold water, then pour into the cooking liquid. 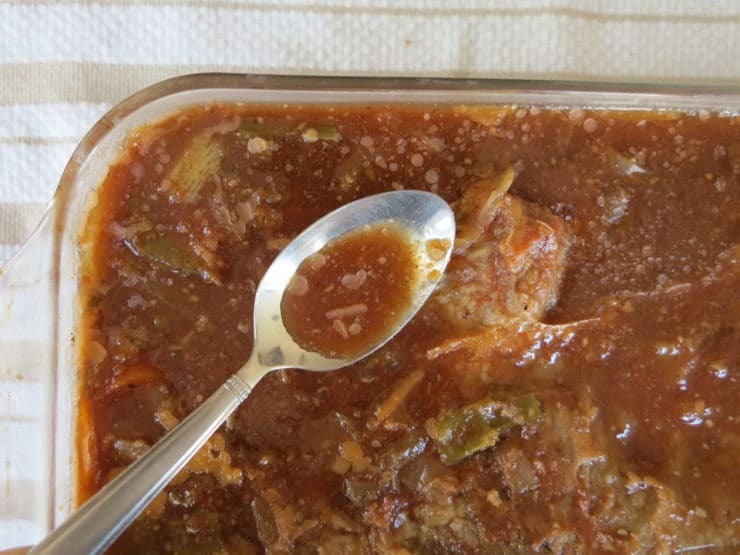 Bring liquid to a low simmer until it thickens to make a gravy-style sauce. You may need more of the potato starch and water mixture to thicken further; add slowly and simmer until desired thickness is achieved. Alternatively, you can blend the softened cooked vegetables (with herbs removed) into the gravy to thicken it using an immersion blender. Add salt and pepper to taste if needed. 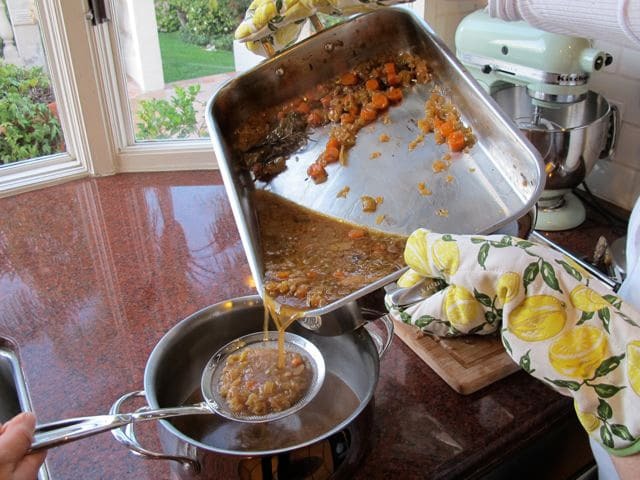 Serve topped with pan juices or thickened gravy, along with the softened veggies if you have reserved them. Garnish with fresh chopped parsley, if desired. 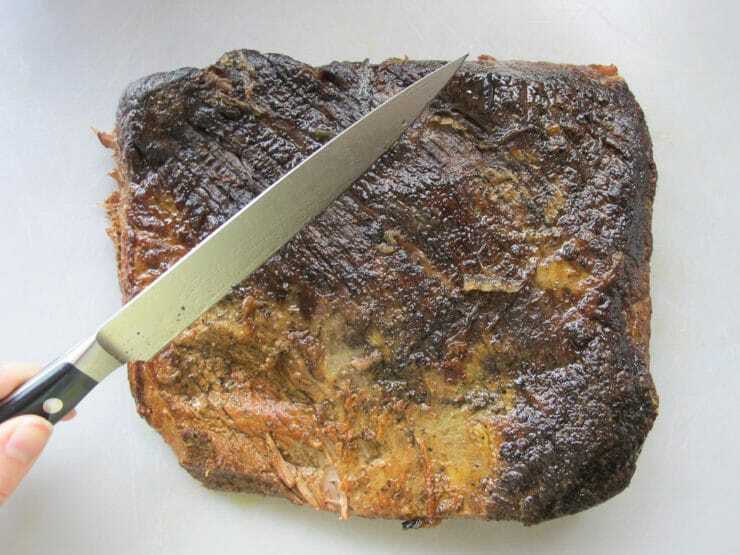 To Make Ahead: After cooking the brisket, open the lid or foil and parchment to vent, then let the brisket slowly return to room temperature. Switch the brisket and sauce to a ceramic or glass dish. Cover with plastic wrap and place in the refrigerator. Let the brisket chill overnight, or up to two days. You can also freeze the brisket up to a week ahead if you prefer. 1-2 hours before serving, remove the brisket from the refrigerator and preheat your oven to 350 degrees F. The fat in the sauce will have risen to the top and solidified. Use a spoon to scoop the fat bits out of the sauce and discard. Return the sliced meat to the dish and spoon sauce over it, making sure to spoon a little sauce between each slice. Cover the dish with lid or layer of parchment and foil, then place in the oven. Let the brisket cook for 45-60 minutes until heated through. You can cook it even longer to let it become more tender, if you wish. 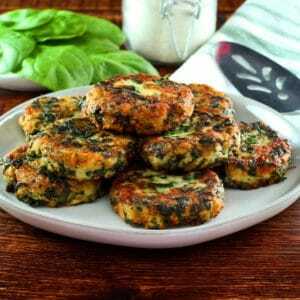 Serve with thickened sauce and softened veggies, using the sauce thickening instructions above. 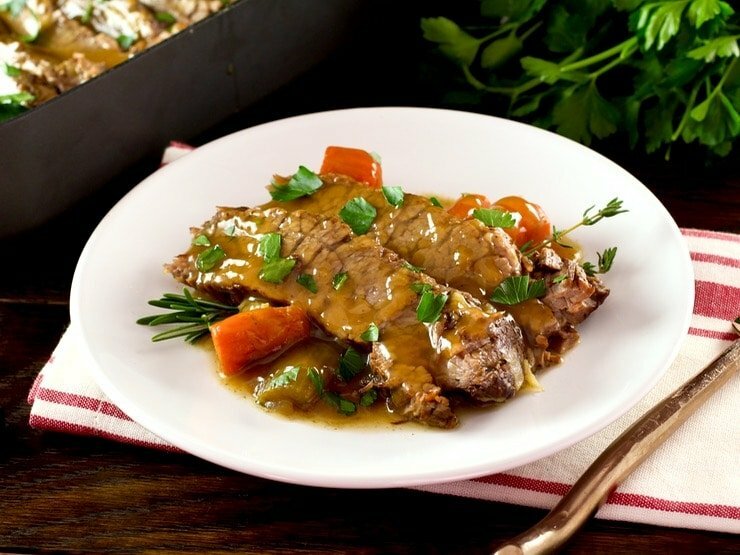 I was thinking of using this recipe in a pressure cooker, braising the brisket separately to avoid burned pieces at the bottom of the cooker and adding vegetables in the last few minutes to get the flavor but to avoid overcooking. From what I can see about 105 minutes for a 7 lb Brisket, cooked at full pressure. But with this recipe, I don’t see why you can’t stop the cooking briefly to test the meat and restart if it needs more cooking. In one comment here someone was taking measures to avoid pressure cooking from degrading the flavor of the meat. Does this really happen? I have seen other pressure cooker recipes for Brisket and they just let it go through the complete cooking time. I have never cooked this in a pressure cooker, so I can’t advise you here. Sorry! This recipe looks so much better than mine. Love the way you are so specific with your instructions. Question: 4 onions seem like way too many. Are they small onions or large ones? I like to use sweet onions which are generally larger. If using sweet onions how many would I use? Hi Adria, I usually use 4 onions and it does not turn out overly oniony. You can cut down to taste. If using sweet onions 2 would be just fine, but you can use more if you prefer. I was reading your recipe for brisket and was curious. Why don’t you use some dry red wine to deglaze the pan. I would think a cup or two would add a wonderful flavor to the sauce and would bring out flavor from the alcohol soluble compounds in the vegetables. Hi David, you can certainly do that. I rarely use wine in my cooking, I only like the flavor of it in certain preparations. For this recipe I wanted a pure, savory herb flavor. Hi Suzanne! First cut is usually what I recommend, but untrimmed. Second cut is a bit too fatty for my taste. First cut is usually leaner, but don’t let them trim the extra fat… you want a little fat there for flavor as it cooks. Enjoy! This recipe completely changed my mind about brisket! I have always despised it as a fatty cut of meat, but my husband loves the stuff. Have tried numerous recipes over the years and hated them all, including my mother in law’s recipe which is the only one my hubby likes. Unfortunately (or fortunately as it turned out! ), her recipe is not kosher for Pesach, so I decided to give this one a try. After smelling it all day, I couldn’t wait to taste it and I was not dissappointed. I couldn’t wait to have seconds and thirds and… This will definitely be my staple brisket recipe. Thank you Tori for another fantastic recipe! My boyfriend wanted to do a Passover Seder party and make traditional Jewish dishes and have the Haggadah and all. We invited several friends over, and, as is customary, I ended up making everything (haha. Southern girl who can cook – Go figure). I’ve never tried Passover dishes before, so I used your brisket, lokshen kugel, and matzoh ball soup because I trust your knowledge will lead me to the light. The brisket was phenomenal!!! The pan drippings were soooo delicious. The soup and kugel were also amazing, and it all left everyone in a food coma. I hadn’t had the chance to use your recipes before tonight, but I’m definitely going to be using them in the future. Awesome Yuri! I’m so happy you enjoyed your meal. Thank you for writing! This looks incredible and I can’t wait to try it. I’d like to serve it with roasted new potatoes, do you have a recipe? Grease a baking sheet with olive oil, then toss sliced wedged new potatoes with 1 tbsp olive oil, salt, and crushed rosemary. 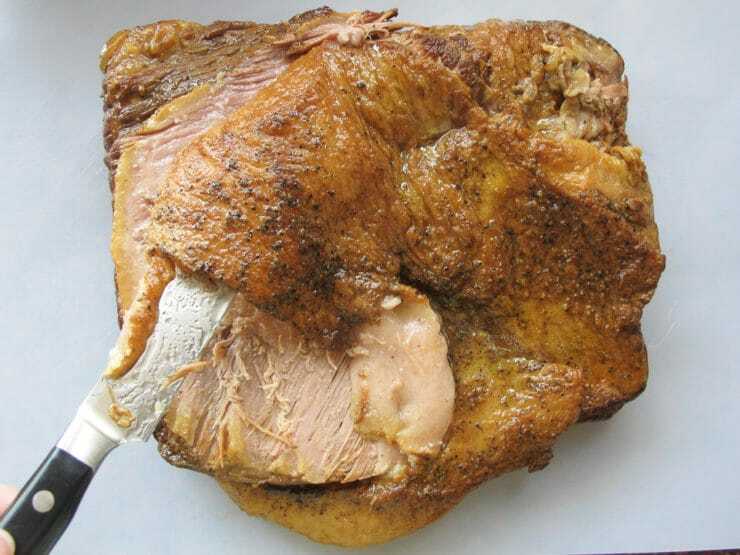 Roast at 400 degrees in the oven until golden brown and tender, stirring once or twice during roasting. 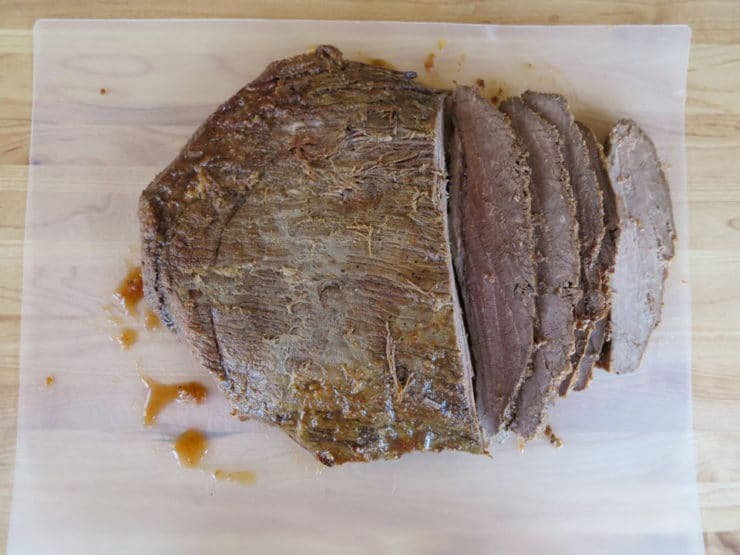 This brisket looks great – do you think I could do it in a slow cooker? I believe you had a slow cooker brisket earlier this year which my husband could not stop raving about to everyone! Love this recipe, making it for Sukkot! Thank you! I will fry all ingredients and put them in my pressure cooker or Thermos pot to cook as in the oven 5-7 hrs used a lot of electricity !! I noticed that if used pressure cooker, the food tended to be not rich, so I will simmer it for 15 mins after I can open the cover !! Even soup taste better this way !! Hi. This looks awesome. Wondering if I can do it my crockpot or will it not be as good? Have you ever tried? Hi Meredith– yes, it can absolutely be made in the slow cooker. Sear the brisket and veggies first in a skillet, then transfer to the slow cooker with the liquid. Cook on the low setting for 7-10 hours until desired tenderness is reached. It will turn out delicious. I usually cook it that way during Passover to free up oven space. It may have a slightly more “shredded” texture due to the moisture that accumulates during slow cooking. I actually like the meat super tender and a bit shredded, so this works well for me. Your house will smell amazing. 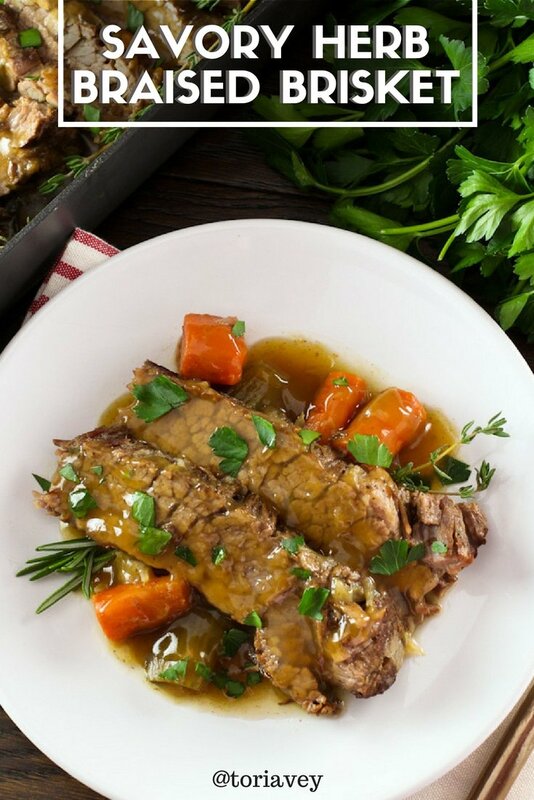 Also here is my Savory Slow Cooker Brisket recipe if you want more specific instructions: https://toriavey.com/toris-kitchen/savory-slow-cooker-brisket/ Enjoy! What brand of beef broth do you recommend? 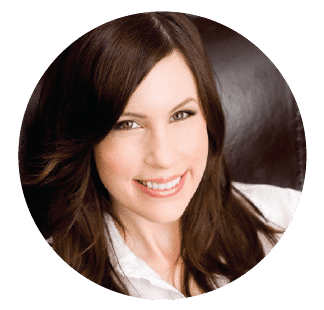 Hi Dori– any brand will do, as long as it’s low sodium. I prefer using organic free range broth for chicken, and grass fed broth for beef. Even vegetable broth will do, but make sure it’s low sodium. Thanks Tori! I made your brisket for my seder, and it was a hit! I took a 4 lb. brisket, cooked it for 5 hours, and it was perfect. So delicious. Barely any leftovers! Thanks for a wonderful recipe! I made this in our slow cooker and it was delicious and our home smelled amazing all day, thanks Tori!! like Debbie, I cooked it for about 3.5 hours and then sliced it thin and froze it – it was definately cooked. I also took all the veggies and herbs and blended them up and poured them over the top along with the gravy and froze it all. I plan to cook/reheat for about an hour. Now I’m wondering if it’ll be enough – mostly kids who probably won’t eat much other than sides and soup! LOL! I have already cooked, sliced and frozen my brisket. After defrosting can I cook it longer in the oven to get it more tender? It is in gravy. Tori, thanks so much for this delicious recipe. Am making it now to freeze for Pesach – should I under cook the meat slightly since it will be frozen and reheated? I have a 4 lb brisket…thanks. Hi Merle, sorry I didn’t answer your comment on the day you posted, it’s been a very busy week. I usually cook the meat all the way before refrigerating (I don’t usually freeze, though you certainly can). If you didn’t cook it all the way, leave yourself plenty of time for reheating so that it will cook to your desired tenderness on the day you serve it. Enjoy! Just bought second cut brisket. Can I make this recipe with this cut as well? Any changes? We just made this for sukkot — perfect for a crisp autumn night! Browned in skillet then cooked in foil pan. Wanted to keep it gluten-free; couldn’t find GF beef broth so used GF onion soup mix instead — a bit salty, but quite tasty! Kids and adults gobbled it up. Thank you! How would you vary the cooking time to use a slowcooker? Hi Tami! After braising on the stovetop, cook it on low setting for 7-10 hours until the desired tenderness is achieved. Hi, I really love all your recipes and wanted to make this for a dinner I am having with my friends tomorrow. I am a college student and don’t own a non-disposable roasting pan. Will it turn out alright if I use a disposable one? 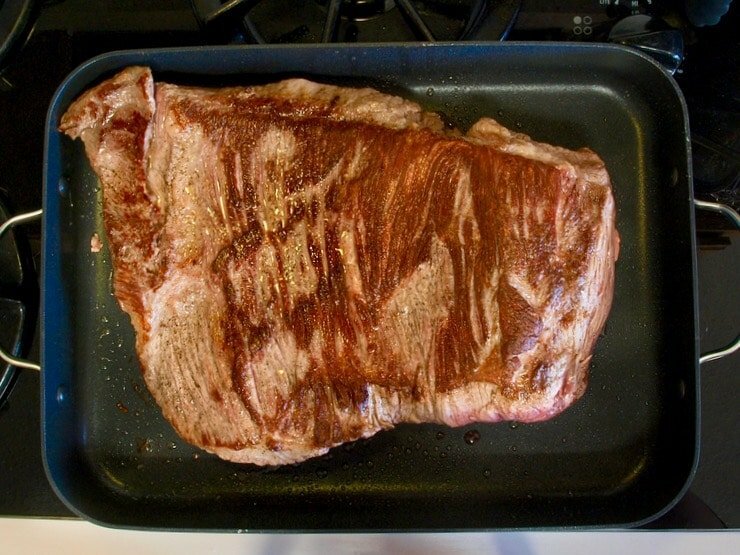 Goldie– Yes, but you’ll need to do the searing (browning) of the brisket in a skillet or some other type of heavy pot. The disposable roasting pan is too thin for stovetop use. After the stovetop browning, just transfer the ingredients to the disposable roasting pan and you should be fine. Let me know how it turns out for you! I made this brisket for my Passover seder, and it got rave reviews. It was super easy to make, tasted delicious and looked beautiful. Thank you for this wonderful recipe! By the way, I didn’t strain the veggies out of the sauce. I left them in and blended it with the potato starch. It was really delicious. Thanks! This looks delicious! Are there any particular recommendations for making in advance and reheating? Hi Anna– I have added make-ahead instructions to the recipe above, hope it helps! 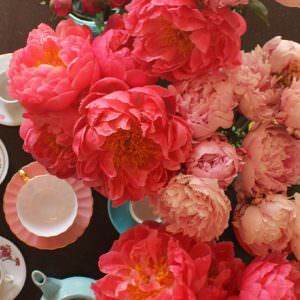 I just want to tell you that I love your blog and your recipes. 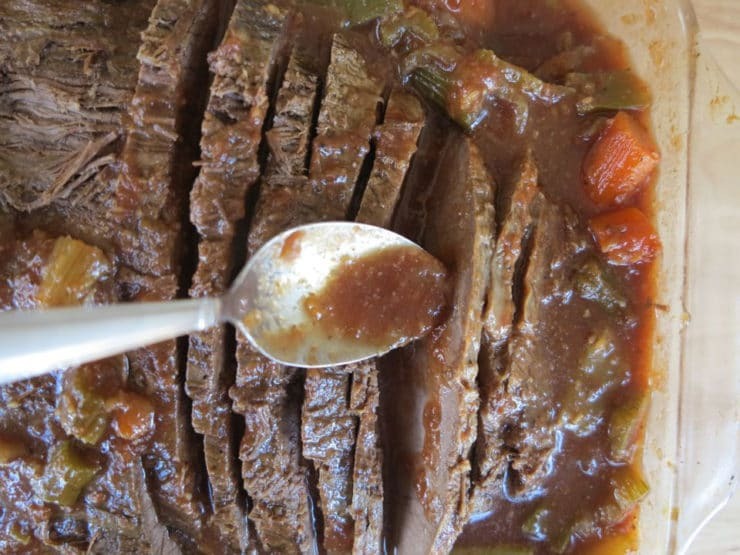 I am going to make your brisket for Passover but since my son will not eat anything with carrotts what I do is put the veggies through the blender so he can’t see them. That not only thickens the gravy but gives it a great taste. Just an FYI. Happy cooking and a sweet passover. This looks deeelish! And I can’t wait to try it out on Monday! Hi Tory! Thanks for posting this recipe. I am excited to try it. I went shopping today in our small town store and could not find a brisket, however there was a corned beef brisket. Can I use corned beef by rinsing well first? I haven’t ever used corned beef. I don’t know if it has a pickled taste or is extremely salty after cooking. Any thoughts? I just finished making the brisket and I like w/ veggies and all! Can you use an aluminum tin to roast the brisket in the oven? Hi Donna– yes, you can, but you shouldn’t use it to braise the brisket and veggies on the stovetop because the aluminum tin is too thin for direct contact with the stovetop. 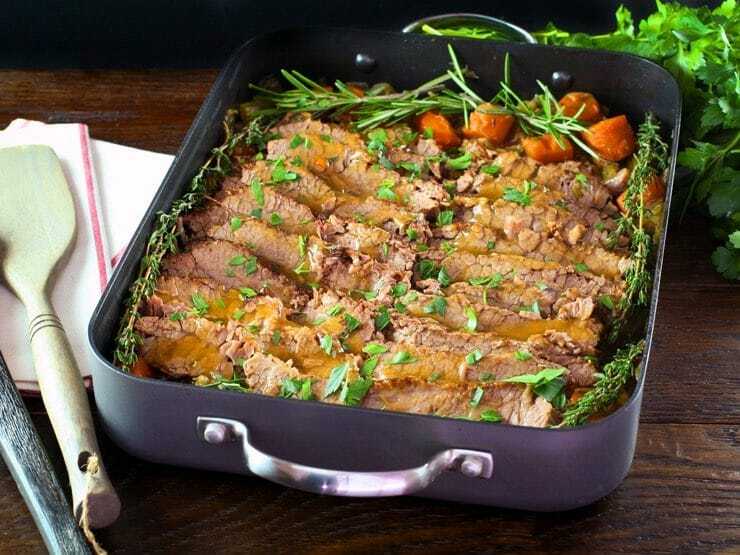 Use a heavy roasting pan or large pot/skillet to braise the beef and veggies, then transfer it to the aluminum pan to roast. Good luck! Hi there. Brisket looks yummy but why didn’t you slice it against the gain? Against the grain equals holiday. With the grain equals pulled beef for sandwiches (at least that’s how it is in our house) Love the blog otherwise!! Big fun! I’m visiting your blog by way of OMSH. 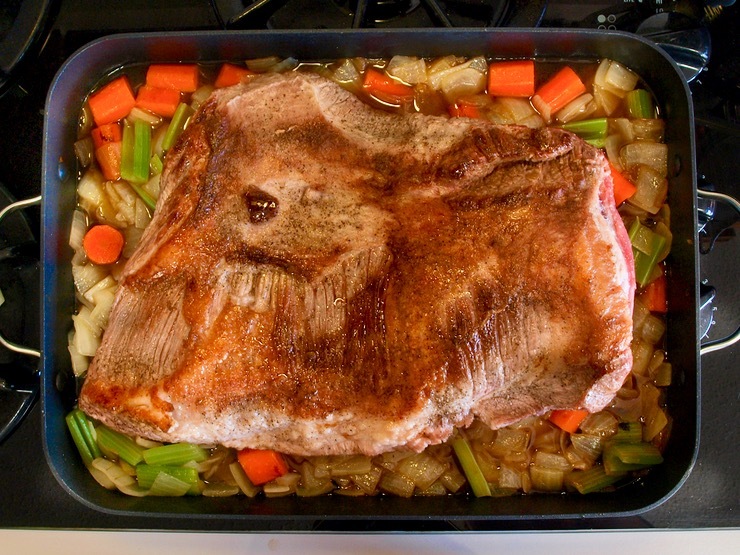 Oh my … I am smitten with your blog and I immediately want to cook this brisket! Carol, so happy you like the site redesign. I’m thrilled with it! Oh this looks wonderful! I can’t wait to make it. Thank you for the great step by step instructions and the nice pictures. I LOVE the new look of your blog, Tori!!! It’s just beautiful! Love the new layout of the site. Your food photography is so beautiful! I’m going to be trying this recipe for sure. Thank you! Great recipe!! served it with mashed potatoes and there were no leftovers left. Thank you for sharing. So glad you enjoyed it Jan!